8 Ways to Use Marketing Banners. When it comes to announcing your business to world, marketing banners are one of the easiest, most versatile, and effective solutions. They’re typically easy to assemble and display, yet provide eye-catching, large-format graphics which effectively capture the eyes of potential customers in a variety of settings, from trade shows to outdoor events to just along the street in your town. Above All Advertising offers a robust assemblage of marketing banners and flags which provide advertising solutions for businesses of all types and all sizes. If you’re curious about how these products can work for you, here are just 8 creative ways in which marketing banners can be of use to your business. Hang a banner outside of your business. Banners can be extremely useful in promoting a business. For one, they act as an easy way to make your retail business recognizable and identifiable as customers walk or drive by. For another, they can be placed in a variety of different places (or you can even place banners in multiple places) to ensure maximum impact. For instance, a hanging banner can be mounted to the building itself; a vinyl banner can be hung in front of the building’s exterior, or mounted between posts or trees. Not only does this make your business easier to find, but it can help capture the interest of people who happen to be passing by. Either of these types of banners can be a great complement to your outdoor kit for displaying at street fairs or outdoor events, too. Fly a flex banner outside of your business. A Flex Banner uses the same shape as our popular flex blade flag, but offers more surface area and a slightly different design to maximize the impact of your company logo or imagery. Available in a variety of sizes ranging from 7 feet tall to a whopping 21.5 feet tall, the flex banner can be customized with your art and displayed outdoors. Either have one large banner flying outside of your business, or create a row of banners for a striking visual effect. Use a mini banner on tabletop surfaces. When it comes to banners, bigger doesn’t always mean better. You can continue your promotion efforts on a smaller scale in waiting rooms, lobbies, or conference rooms with a creative indoor sign such as the Flex Blade Mini. Sized to fit on counter tops or side tables, this small banner is mounted on a metal base so that it can be displayed anywhere and easily moved. Whether it’s used to promote a specific product or service or just printed with your company logo, these tabletop banners are an eye-catching way to promote your business on a more subtle level. Make a billboard wherever you are. You might not be able to pay for printed billboards all over town, but you can create your own billboard and bring it wherever you want with our Flexi-Billboard, which is an easily transportable, lightweight, custom-printed free standing billboard. Available in 3, 6, and 8-foot wide options, there is a size and a statement available for any type of promotion you’d like to do for your company. Bring your own billboard to outdoor events, trade shows, or place it outside of your place of business to draw attention to your brand. Make a moving banner with the flex blade backpack. 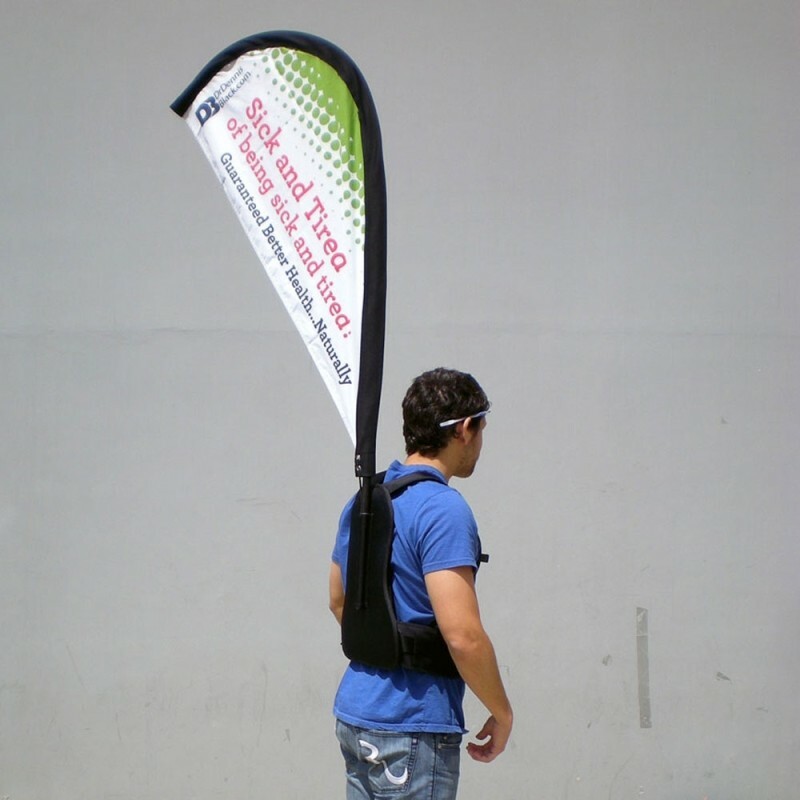 Advertise on the move--and delight customers with an engaging, eye-catching design--with our Flex Blade Backpack Flag. Comprised of a reinforced backpack with an advertising banner attached, this clever design also allows for functional storage: the backpack has a pocket for brochures or business cards, so when customers inquire (and how could they not with a cool design like this? ), the holder of the backpack can hand out advertising materials to keep your company fresh in potential customers’ minds. 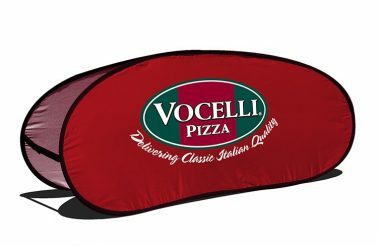 This is a fantastic advertising option for street fairs, trade shows, or sporting events. Bring people in from the street with boulevard banners. You can turn any street sign or lamppost into an advertisement for your business with boulevard banners. These long, rectangular signs are designed to be affixed to poles or pole-like structures, so they work perfectly along a bustling street or even outside of your business or organization. The banners can be printed with your logo or company imagery, or can be used to promote a specific event such as a big art show at a museum or an upcoming event. At 26 by 60 inches, boulevard banners are large enough to capture viewer attention, yet slim enough that they won’t be distracting when walking or driving down the street. These custom-printed banners are sleek and sophisticated and ideal for a number of different types of promotion. Use an elbow banner to announce special events. The elbow banner has been one of the most popular advertising banners for years, and with good reason. With a simple “elbow” shaped stand, a banner can easily and securely be mounted and displayed either indoors or outdoors. Easy to assemble and easy to move when needed, the display can be used to showcase a banner with your branding, or to advertise a special event, on either a single or double-sided imprint. In addition, different sizes--either 8.5 feet or 13 feet tall--allow you to choose how large your impact is on the public. Whether it’s to launch a product, promote a big event or sale, or to simply alert customers that your business is nearby, an elbow banner is an easy and effective way to generate attention for your brand. Create a mini event or display booth with a 3-in-1 display. Looking for a little more from your banner? The Flex Blade 3D is truly unlike any other advertising display unit, combining some of the best aspects of a banner, a podium, and a display unit in one simple format. It can be separated into two advertising flags and a print, or combined to form an eye-catching overhang. The entire unit can be customized with vibrant color artwork, which makes it interesting and engaging to behold. The unique format and shape makes it suitable for trade shows, point of sale purchase units, or in-store demos. Best of all, it only takes minutes for complete setup (or takedown) and is very lightweight, ensuring that you can take it anywhere you need your business to go. Conclusion: Marketing banners can fulfill a number of advertising solutions for your business. Whether you’re displaying indoors or outdoors, providing general signage or promoting a specific event, there’s absolutely a banner that is right for the job. It’s well worth exploring what advertising banners can do for you and your business. Have you ever used marketing banners for your business?